The “2014 Oscar Nominated Shorts — Animated” collection opens Friday at Sundance Cinemas. Not rated, 85 minutes, three and a half stars out of four. Animated features in 2013 tend to look about the same — computer-animated, big stars, in 3D wherever possible. But flying below the radar, the animators of short films tend to have a little more leeway to try some different techniques — like drawing! — and the result in this year’s batch of Oscar-nominated animated shorts is a delightful collection that varies in style as much as theme. Which is not to say computers are absent. “Mr. Hublot” is set in a mechanical Paris where the birds are robotic, commuters get to work via propellers in their heads, and one fastidious man has a numerical readout in his head to count down the day. He spies an abandoned (robot) puppy across the street and decides to adopt him — but in this world, mechanical animals grow even bigger than real ones do. The title is clearly an homage to Jacques Tati’s “Mr. Hulot’s Holiday,” but “Hublot” has an intricate wit all its own to match its inventive visuals. “Get a Horse!”, which played before “Frozen” and therefore all your kids have seen it at least twice, cleverly bridges the gap between Disney past and future. Most of the film is a zippy classic Mickey Mouse black-and-white ‘toon in the vein of “Steamboat Willie” — until the characters start breaking the proscenium and popping out of the frame in full CGI. The creators of the charming 2011 Oscar nominee “The Gruffalo” are back with another adaptation of a children’s book by Julia Donaldson. 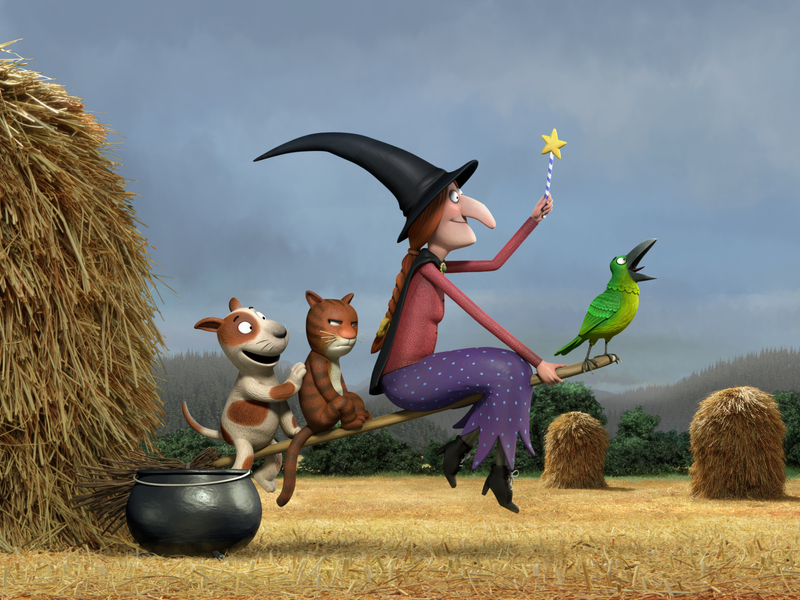 “Room on the Broom” is an enchanting tale of a big-hearted witch (Gillian Anderson) who lets more and more critters ride on her broom, to the consternation of her cat (Rob Brydon of “The Trip,” who meows with gusto). Like “Gruffalo,” the film is like a picture book come to life, with vibrant colors and painstaking visual details, and more importantly, the feel of a single, compassionate authorial voice telling the story. Shifting into much darker tones is the hand-drawn “Feral,” which uses slashes of grays, blacks and whites to tell the story of a boy raised in the wild who gets adopted and brought to a public boarding school. This does not go well. 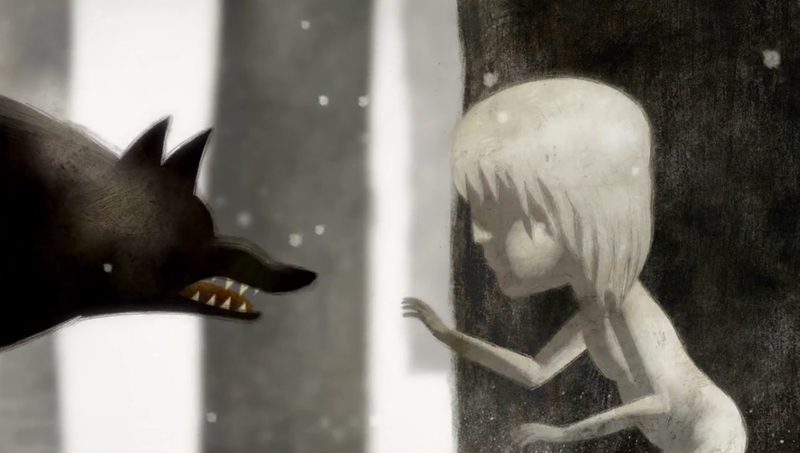 The animation gives “Feral” a dreamlike quality, as the boy transmutes into wolves, birds, and the other animals he feels a closer kinship with than his fellow humans. The final nominated film is “Possessions,” an anime horror tale of a traveler who becomes trapped in an abandoned cottage filled with forgotten junk that comes to life, including a talking painting, a forest of broken umbrellas, and a dragon made out broken pots and other detritus. It’s like Stephen King does “Hoarders.” This and “Feral” are the only two films that aren’t really suited for younger kids, although older kids (10 and up) should be just fine. To round out the collection, three other acclaimed (but not Oscar-nominated) animated shorts are also featured. The charming Pixar short “The Blue Umbrella” (which played before “Monsters University”) tells the story of a courtship between a blue umbrella and a red umbrella on a crowded city street that you would swear is live-action footage. Along the way, we see ordinary objects in the city — a construction sign, a storm drain — displaying anthropomorphic features as they try and get the two lovebirds together. Two other films, “The Missing Scarf” and “A La Francaise,” I haven’t seen. But the six films I have seen are enough to highly recommend one of the best animated collections in recent years. ← Like to talk about movies? Come join my post-show chats at Sundance! I heard the giraffe/ostrich thing between films was pretty lame — that wasn’t part of the package when I reviewed the shorts. It was indeed. Maybe that’s what soured me on the whole thing.